Why not give your guests a lasting gift to take away from your wedding reception. Our extra small candles (size 50x110mm) are a beautiful gift idea. Each candle contain the name of the bride and groom and the date of wedding. 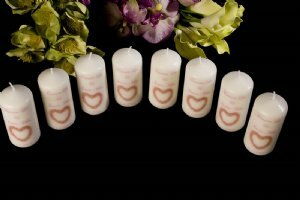 You may choose your design from any of the designs we have available, or place your own design or theme onto your gift candles. There is also room for a small personal note if you wish. Each candle is gift packaged in a beautiful white organza bag. We can place any image onto your bonbonierie candle - even your own image if you have a specific theme that you wish to carry throughout.